OSWEGO, NY – The Oswego Lions Club is still seeking vendors for its upcoming Rivers Edge Craft Show. The event is slated for June 9 from 10 a.m. to 4 p.m. on West Linear Park, in Oswego. 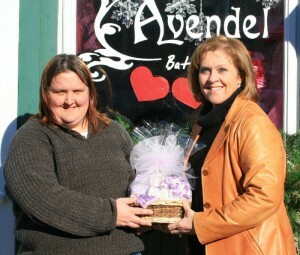 Pictured is Kim Westcott from Avendel Bath and Lion Chris Pelton, right. Westcott, returning from last year’s show, will showcase her famous soaps, lotions and bath accessories. Several returning vendors include Johnny Deary’s woodworking, making outdoor furniture, Dan Rupert woodworking with his unique birdhouses and other wood crafts and Groggs Pottery with his fun sculptures and unique pottery to name a few. There will also be new vendors with hand-crafted jewelry, florals, canvas bags and many, many other craft vendors. The day will be filled with fun for the entire family with entertainment from The Lubricators, karate demonstrations by Oswego Karate, food and drink vendors and much, much more! The deadline is fast approaching, so contact us to reserve your space!